Like nearby Hong Kong, Macau is classified as a Special Administrative Region in China because it was once a foreign colony. The first Portuguese ship anchored there in 1513 and historians believe that it landed somewhere near the A-ma Temple, which is dedicated to Mazu, the goddess of seafarers and fishermen. When the Portuguese sailors asked the name of the place, the locals replied with the Chinese name of the temple, which was “Māgé Miào”. 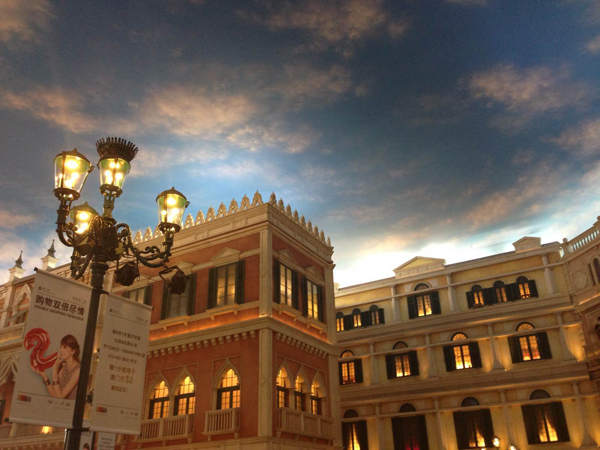 It is believed that this is where the name “Macau” came from. Talk about getting lost in translation! By 1557, Portugal began paying tribute to the Ming Dynasty (1368-1644) for the right to settle the area. It was swiftly developed into a major international trading port, but remained largely under Chinese control until 1887, when a mutual agreement between the Qing Dynasty (1644-1912) and Portugal granted Portuguese sovereignty. Although it was swiftly overtaken in trade by Hong Kong, it would soon come to serve a far more important purpose. Throughout the Second Sino-Japanese War (1937-1945) and the Second World War (1939-1945), Macau was declared a neutral territory, unlike Hong Kong. Chinese and Europeans flocked to the region, and it soon grew to become one of the most densely populated areas on earth. In 1987, by using the Hong Kong Joint Declaration as a model, Portugal and China finally reached an agreement to return Macau to Chinese control in 1999. In exchange, Macau must remain autonomous for at least 50 years after the takeover. As outlined by the policy of “one country, two systems”, Macau’s citizens have the right to elect local leaders, travel freely, and maintain their way of life, although matters of foreign policy and defence are handled by China. 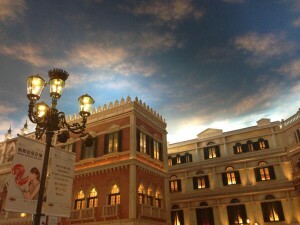 Yet it seems that what happens in Macau, really does stay in Macau! Heralded as the “Vegas of China”, gambling has been legal in the region since the 1850s and is the only place in China where gambling is legalised. It is home to a horse-racing track, the Macau Jockey Club, the dog-racing Canidrome, and 33 casinos, the largest of which is the Venetian Macao. A reclaimed patch of land, known as Cotai, is now the site of numerous megacasinos and is said to resemble the Las Vegas Strip. Alongside Cotai, Macau is made up of three other areas: the Macau Peninsula, and the islands of Taipa and Coloane. The region itself has a subtropical climate, with hot, rainy summers and mild, dry winters. Temperatures regularly reach heights of 29 °C (84 °F) in summer, but fall to a comfortable 15 °C (59 °F) in winter. The Macau Peninsula houses the old city centre, which is celebrated for its colonial buildings, while Taipa is home to some of the region’s finest Macanese architecture and Coloane is known for its pristine sandy beaches. Nowadays nearly all of the population is made up of the Han Chinese ethnic group, although there are small constituencies of Portuguese people and people of mixed Chinese and Portuguese ancestry, known as the Macanese. Cantonese and Portuguese are the region’s official languages, although English is also widely spoken. 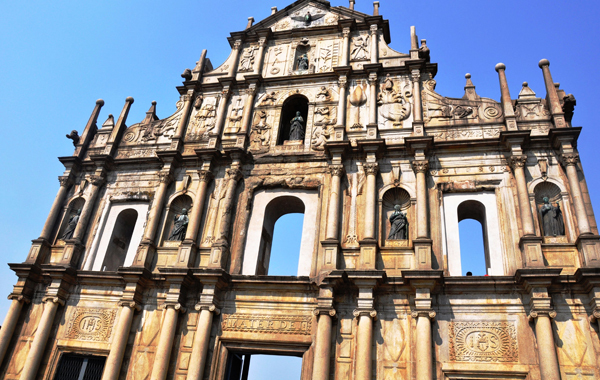 Macau is a true hybrid of cultures, with stately Portuguese churches sat side-by-side with traditional Chinese temples. Many of the region’s most celebrated historical buildings were collectively designated a UNESCO World Heritage Site in 2005 under the banner the “Historic Centre of Macau”. These include the stunning 16th-century Ruins of St. Paul’s, Igreja da Sé, the A-ma Temple, the Fortaleza do Monte, the Sir Robert Ho Tung Library, and the Old City Walls, along with 23 other sites of historic significance. The Ruins of St. Paul’s are what is left of St. Paul’s College and the Church of St. Paul, which tragically burned down in 1835. All that remains are the intricately carved southern stone façade and the underground crypts. The Old City Walls are in a comparable state of ruin, since they were originally constructed simply out of clay, sand, rice straw, rocks, and oyster shells. Fortunately, Macau’s other historic attractions have had better luck! The Igreja da Sé is the current cathedral in Macau and was completely renovated in 1937, while the Fortaleza do Monte or “Mount Fortress” has remained virtually unchanged since 1626 and now houses the Museum of Macau. Similarly, the Sir Robert Ho Tung Library originally belonged to the mansion of a well-known Hong Kong magnate named Sir Robert Ho Tung, but was converted into a public library on his death in 1955. In the city centre, these venerable old buildings jostle with the modern skyscrapers that make up this multi-cultural metropolis. The Macau Tower, which looms over the city at over 330 metres (1,100 ft.) in height, offers panoramic views of the surrounding area, along with built-in restaurants, theatres, shopping malls, and the thrilling Skywalk X. Visitors can bungee jump from the tower’s outer rim, although there is also a controlled and tethered “sky-jump” for the less adventurous! For those who prefer to keep their feet firmly on the ground, Macau is famous for its myriad of delightful museums, including the Macau Museum of Art and the Macau Cultural Centre. There is even a wine museum, where visitors are welcome to taste over 50 different varieties of wine. Just be sure not to drink and drive, because Macau is known for its fast cars! The largest event of the year is the Macau Grand Prix, which takes place in November along the main streets of the Macau Peninsula.